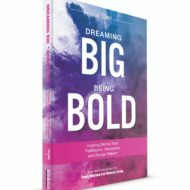 Dreaming Big Being Bold Volume 3 is an International Best Selling book! A collection of inspiring Stories from Trailblazers, Visionaries and Change Makers. DENISE LALONDE, Carol Koepke, Claudia Beswick, Craig Dubecki, Debbie Adams, Diane Gies, Dominic Mitges, Greg Adams, Jennifer Slay, Jully Black, Karen Blanchard, Kevin Kingma, Kimberley Gunning, Marilyn Robinson, Martin Buckland, Matt Leblanc, Melissa Maloney, Mitch Brogan, Nicole Snobelen, Nkechi Nwafor-Robinson, Rebecca Summerfield, Ron Lord, Samuel Saintonge, Sandi Danilowitz, Paula Morand and Victoria Craig.